Are you sure that you are properly protecting your rights? Have you executed an installation, but cannot get your due pay? Did you order the creation of a system but the start-up date is long overdue, and there is no end of the work in sight? Despite what it might seem, these are not the worst things that can happen to you. The real trouble can begin if you hadn't taken care of your rights already when signing the contract. The implementation of a system (i. e. smart home, air-conditioning, heat pumps, audio/video system) is a grand undertaking, both for the investor and for the contractor. Such situations are rare, but that's no consolation for anyone experiencing them. That's why - instead of hoping for luck - you'd better make use of professional documents securing each party their full rights. 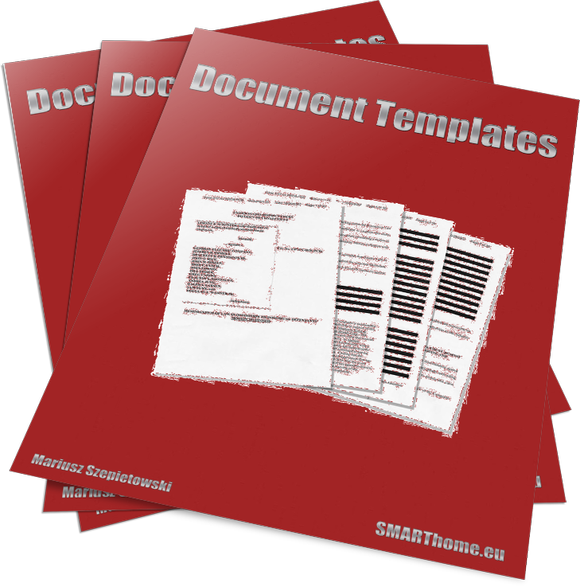 We are offering you document templates written by SMARTech experts with assistance of lawyers. Beside a contract draft for an installation we are also providing you with i. e. commissioning protocols, system verification documents, even calls for payment. no browsing of legal documents, in order to find out what rights you have in connection with the contract. all documents are universal in nature, so you needn't waste time to consult them with a lawyer. These document templates do not require modification. They can be printed and signed after filling in the basic data, like orderer and contractor name and address, order value or date of completion. 47 EUR – you only need to invest this much in order to receive these document templates as MS word files. Thus you gain access to this information any time and anywhere you should need it. Bonus: A 167-page basic guide to smart home systems.